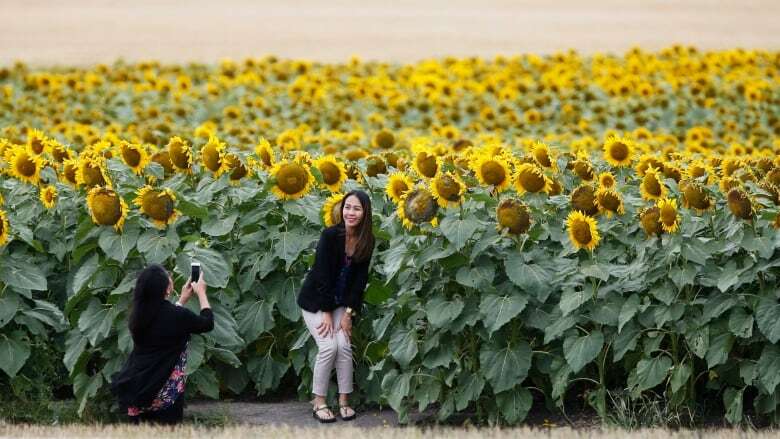 A Winnipeg-area farmer is losing his sunny disposition over the number of people showing up and damaging his sunflowers while taking selfies. Thousands of sunflower shutterbugs have been gathering along a gravel road on the edge of Winnipeg to revel in the rows and rows of the bright yellow flowers of Bruce Stewart's oilseed crop. "Saturday and Sunday there was at least 1,000 people here on the weekend each day," said Stewart. "Do you know how many sunflowers are knocked down by 1,000 people? Quite a few." On Tuesday afternoon, two vans full of people were parked on the side of the road as several people crowded into the crop taking pictures of each other. 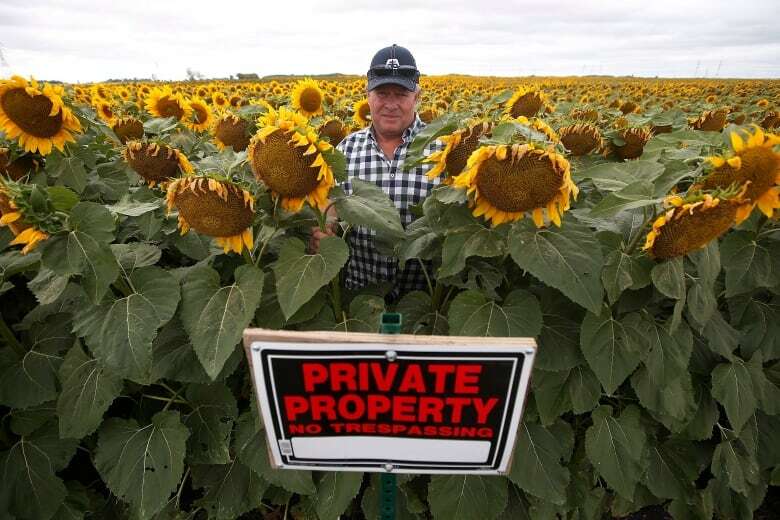 They walked deep into the sunflowers, touching their heads despite nearby signs that declared it private property. Stewart has been growing sunflowers for many years but it's the first time on this stretch of land. He doesn't know if it's the close proximity to the city or that word has spread online about the beautiful view, but crowds of people have started to show up for photos. While some of the produce paparazzi stay on the road, many wander deep into the field causing damage to the plants. On Sunday, Stewart even spotted people with lights, tripods and light modifiers for a special shoot. Stewart pointed to a sunflower ripped right out of the ground, and another whose head was damaged. "I don't know what they are doing back there but I guess we will find out when we combine them two months from now," he said. Others leave behind garbage, Stewart said. On Monday, he had to walk the stretch of road picking up discarded coffee cups. The farmer said he doesn't mind people taking snaps of the sunflowers and he even put up a sign with his phone number for photographers to contact him. However, he said he wants everyone to understand that going into the field causes damage. "I think they are not educated. They are not up to speed on the whole process," he said. "It's just too many generations removed from primary agriculture or primary food production." As long as people stay on the road, Stewart said they can "take pictures all day long." "I don't have to pay for your film or your camera or whatever ... I should be charging $5 a head," he said with a laugh.